After returning from my long vacation (which involved far too much driving), I discovered that I had fifteen (15!) books on my list of "books to review." Well. 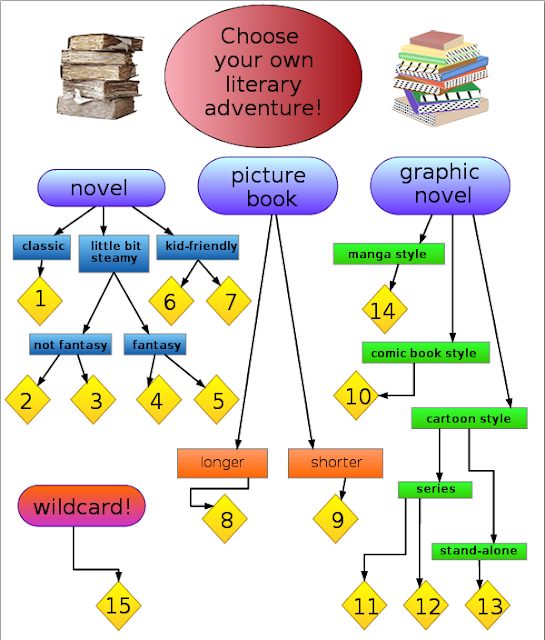 In an effort to quickly review all 15 books (because they all deserve attention), save time, and have a little fun, I decided to create a flowchart for you. Did this actually save me any time? I do not know. Title, Author. descriptors. (Mini-summary) *My comments. Hound of the Baskervilles, Sir Arthur Conan Doyle. (Sherlock Holmes and Watson solve the murder.) *Tons of people in the book club said "it was better than I thought it was going to be." Also, if, like me, you saw the Wishbone as a kid and think it gave things away, you're wrong. Fat Cat, Robin Brande. little bit steamy, total girl book, realistic fiction (Girl lives like a Neanderthal for a science fair project.) *The author actually did this! Silent in the Grave, Deanna Raybourn. little bit steamy, historical fiction, mystery (Young widowed Victorian woman solves a murder mystery.) *Very fun. Dark, but I didn't get nightmares. A friend said she was guessing until the end -- I knew the killer, but didn't know his motivation. Shiver, Maggie Stiefvater. little bit more steamy, fantasy, modern day (High school girl loves the wolves in her back yard. However they may be dangerous.) *Love the cover art! Also I couldn't put it down. Also I hate that [big fatty spoiler deleted]. Fire, Kristin Cashore. little bit steamy, fantasy, adventure, has companion novel (Fire is a super-gorgeous girl who can control minds. But she's got a nasty heritage to overcome.) *I read Graceling first, but Fire stands very well alone. Also it won in it's Cybils category this year. The Magician's Elephant, Kate DiCamillo. could read aloud to a kid, fantastical, funny, set in the past (An elephant falls out of the sky and that comes with consequences.) *I like all of DiCamillo's stuff I've read. This one begs to be read aloud. 11 Birthdays, Wendy Mass. could read aloud to a kid, fantastical, funny, modern day (Time stops on the 11th birthday of two former best friends.) *Thoroughly enjoyed it, easy for both boys and girls to like. How Do You Wokka Wokka, Elizabeth Bluemle. longer, more detailed illustrations, rhythm-and-rhyme text (Kids in the neighborhood wokka-wokka together.) *Whole fam loves this one. We wokka wokka all the time. I Like it When... Mary Murphy. shorter, more spare illustrations, bold colors and heavy lines (A little penguin shares his favorite parts of the day.) *Adorable. I love Mary Murphy's stuff. Simple and sweet. Outlaw: The Legend of Robin Hood, Tony Lee, Sam Hart, Artur Fujita. adventure, comic book style, (Robin Hood outwits and outfights the nefarious Prince John and his cronies.) *One of my favorites! Having only ever heard the Disney version of the legend, I found this one awesomely detailed and really action packed! Fashion Kitty; Fashion Kitty and the Unlikely Hero, Cherise Mericle Harper. adventure, cartoon style, girly, (The first tells how Fashion Kitty came to be. The other, tells about the fight against school uniforms!) *I liked Unlikely Hero better than the first volume, and especially enjoy little sister Lana. Adventures in Cartooning, James Sturm, Andrew Arnold, Alexis Frederick-Frost. adventure, cartoon style, humorous, instructional (The knight must defeat the dragon to save the princess. A helpful elf moves things along AND gives basic instruction on making your own cartoons.) *I was snorting with laughter, need I say more? Super cute and appropriate for all ages. Wicked Lovely: Desert Tales, Volume 1: Sanctuary, Melissa Marr, Xian Nu Studio. fantasy, manga style, modern day, (A fairy girl has a crush on a mortal boy...) *At first it took me a bit to figure out which characters were boys, as everyone looked like girls to me. Once I got used to the style, I was hooked on the book. I've got vol 2 on hold at the library now. And I have not read the novel Wicked Lovely from which this is adapted. Tales from Outer Suburbia, Shaun Tan. Short stories, collage, painting. (I suggest you look for summaries elsewhere, just thinking about summarizing this book makes my brain hurt.) *I liked it a lot. It made me think. And laugh, and want to meet a water buffalo. None of the stories are very long at all. I made the flowchart using Flowchart.com which is currently in beta-version. It was pretty good. Didn't take me too long to figure it out. Unfortunately there was some discrepancy between what I had done (as viewed on my screen) and what was saved and exported (as a file). So I ended up taking a screenshot of the beautiful, correct version. Please, don't be stinting with your praise. If you want more details on any of the titles, just ask! So which of these 15 books was your favorite? Which one do you want me to read the most? Praise, praise! Very clever way to do 15 books at once. This is so fun! You read so many! The flow chart was really cool. Now what I need is a neat little way to mark the reviews I read and print out a list that I can use to get them at my library or buy them. That would be super awsome! Jacob - psh! Favorites! Who can say? First, you should buy me Outlaw, because it's the one I want you to read the most. Melissa - thank you. thank you. I agree on Sir Arthur Conan Doyle. I remember thinking wow this is actually quiet timeless.